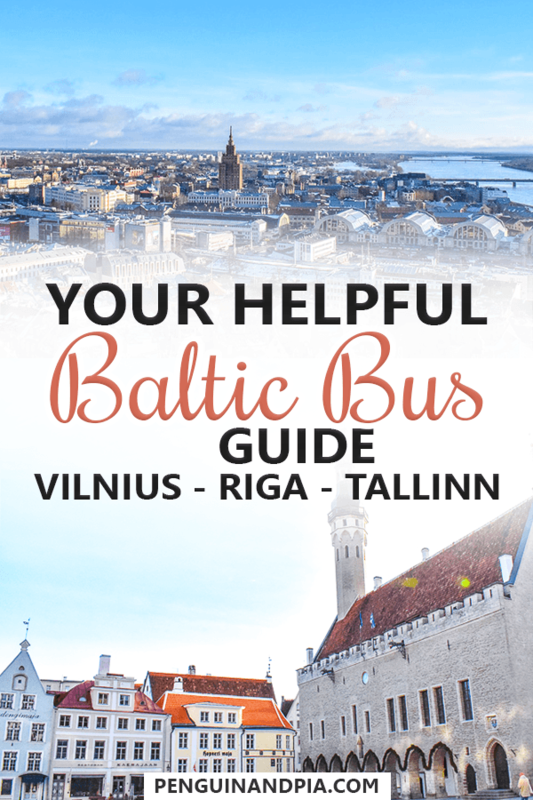 Here’s The Complete Bus Journey from Tallinn to Riga to Vilnius! If you are considering a trip through the Baltic countries, getting between the capitals is a popular route. Heading from Tallinn to Vilnius through Riga is a great way to see the best of each country on a bit of a “mini tour”. 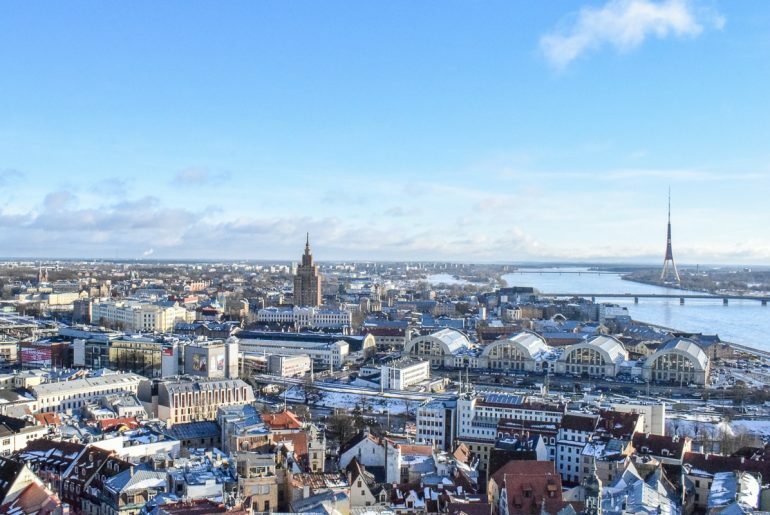 Riga (and Latvia in general) made it on to our 2019 travel bucket list – but the other Baltics countries would surely be seen on a trip that way, as well! Eric did this trip a few years back (between our first trip together) and absolutely loved the Baltics. That said, he took the bus between them – which is a popular way to do it! You might be looking for the train or even the flights between them – but this post is all about the bus! As per the title, the capitals are a popular routs since they are basically stacked one on top of another. That said, Eric travelled them in the reverse direction from bottom to top – or Vilnius to Tallinn. But, they are the exact same route, same bus stations, etc. Heading top down or bottom up as you travel through the Baltics is entirely up to you, your interests, and your onward schedule! Eric took the bus between Vilnius and Riga, and then from Riga to Tallinn. Truthfully, he also went from Warsaw to Vilnius but that portion is not included in this post. It was also with LUX Express and it was also a great experience – although it was like an 8 hour bus. He did this trip in the winter (January) but the roads were totally fine. Overall, travelling with LUX Express was a great decision. They are basically the only bus provider that does the entire Baltic region but their service is cheap, safe, and definitely quality. (There is also Ecolines but we didn’t travel with them so we can’t say much about them). 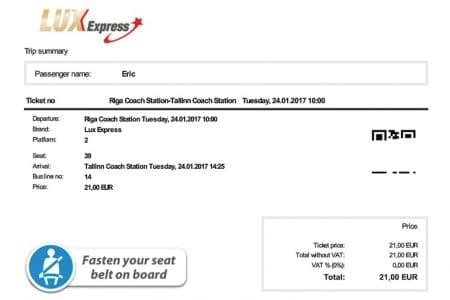 Tickets were booked online very easily on their English site – and the printed tickets worked perfectly with the driver. There’s really not much else to say because LUX did a great job. The buses had wifi that actually worked which was a plus and you can pay for upgrades but we don’t think it’s necessary. The standard seats are great enough. We would ride again with LUX in a heartbeat. You can visit their website to buy tickets, look at timetables, and gather more Baltic route/company information. If you want to see what the printed out tickets looked like, here they are below. Now, we don’t remember if you can show the ticket on mobile. It has a scanning barcode BUT just to be safe you should print the PDF they mail you after purchase. Note that they had a platform number, seat number, and everything else you’d expect from a bus company with their act together. Not like on Balkan buses… Just kidding! …then from Riga to Tallinn. Now that we’ve chatted general logistic about the Baltic bus journey, here’s a more detailed description of each leg of the journey. Of course, some of the information or timetables may have changed so it”s important to check your ticket for your trip. That said, this is to help you with what to expect on the bus ride through the Baltics! 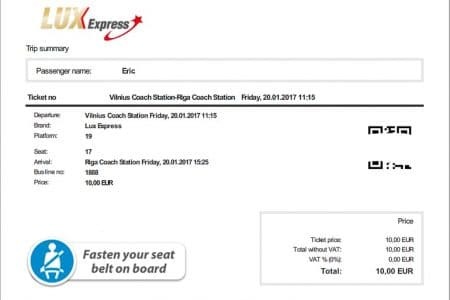 Also remember that Eric did the bus trip through the capitals from Vilnius to Tallinn (south to north) but the details are basically the same to do the journey in the reserve order! There are also loads of smaller cities in the Baltics that we are yet to discover but many of them are accessible from the capitals – but that’s just a side note! 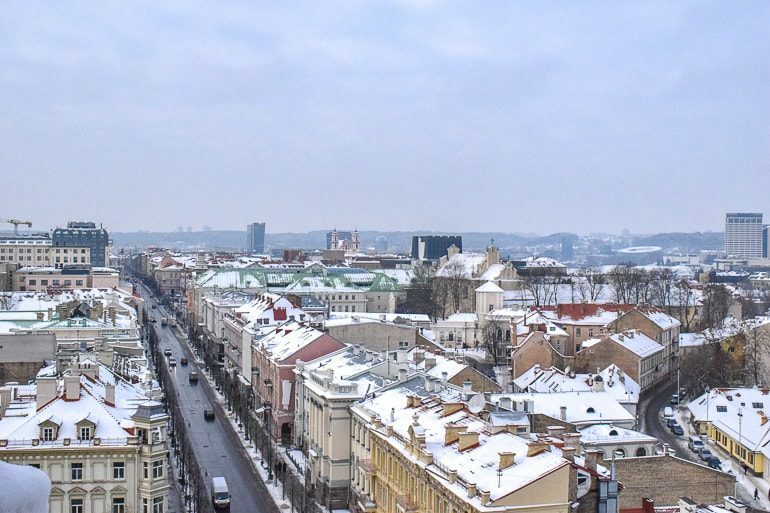 Overlooking Vilnius – it’s a pretty city with loads to see! Okay so first up is the bus ride from Vilnius, Lithuania to Riga, Latvia. Honestly, this was a pretty uneventful bus ride – which is a good thing to say about a bus ride in a foreign country. The total trip time was 4 hours and 10 minutes leaving at 11:15 am and cost 10.00 Euro because it was ahead plenty in advance and done online. There were multiple bus times through the day and you can find the timetable here. In Vilnius, the bus station is right by the main train station. You can go inside/through it and you will appear out on the platforms. There are loads of local mini-shuttles doing local bus routes and then spaces for the larger coach buses. The numbers are pretty well marked and the signage is good. The info desk ladies spoke English but Eric’s local driver on a day trip to Trakai Castle (coming in another post) did not speak English. Just a heads up. All you have to do is show your ticket. If you’re on the wrong bus, you’ll find out pretty quickly when the (typically) older Lithuanian man driving just casually waves you away. In this case, the LUX bus came to the platform as stated and the driver checked the ticket against his “check in” app/program on his phone. Any larger bags can go underneath and the driver did tag and number the bag when it went under. This was probably one of the few times the driver ACTUALLY checked the ticket number at the destination before handing out bags. If you’re a Europe bus traveller you might know this awful feeling of uncertainty with bags under buses so this was a nice change to feel secure with LUX. The bus was also only half full so it was a nice ride! When you travel from Lithuania to Latvia, there is no formal border crossing where they check passports. This is because Lithuania, Latvia, and Estonia are all part of the Schengen Area. This is an area in continental Europe where there are no internal borders. Once you enter it with whatever passport you hold, you can move freely between countries. So, the bus just drives along and them all of a sudden you see a blue sign with the EU stars on it to tell you you are now in Latvia from Lithuania. That said, the driver DID look at Eric’s passport when we left Vilnius but it was basically just to see which nationality you were and to check ID. There is literally no border guard to check your passport. Overlooking the Riga Bus Station (white rectangle in the middle) from St. Peter’s Church. Once we got into Riga, the bus puled up to the main station in this massive round loop. We all got off, grabbed our bags from the driver (who did check ticket numbers – so hold onto your bag’s ticket stub) and off we went into the Old Town. and absolutely loved his stay. We mention it in our massive guide on European hostels, if you are interested. Next up we have the bus ride from Riga, Latvia to Tallinn, Estonia. This ride was also pretty uneventful. The total trip time was 4 hours and 25 minutes leaving at 10:00 am and cost 21.00 Euro because the route is a little more popular and we chose a good time (Tallinn is probably the most popular of the Baltic capitals). Like above, there were multiple bus times through the day and you can find the timetable here. For this bus ride, Eric was joined by a British guy named Craig. They actually stayed at the same hostel in Vilnius but took different uses to Riga. They became better friends in Riga and then coordinated the same bus to Tallinn! So, with Craig, Eric walked from the hostel to the bus station. You enter the main doors and you will see the platform screen above. Stick tot he right side of the station and you will see the exit doors to the “departures” and platforms. You get picked up basically on the other side of the “U” from where you get dropped off days before! Like the border crossing above, both Latvia and Estonia are in the Schengen Area. This means that there is no border crossing. Just a sign you pass letting you know you’ve changed countries! 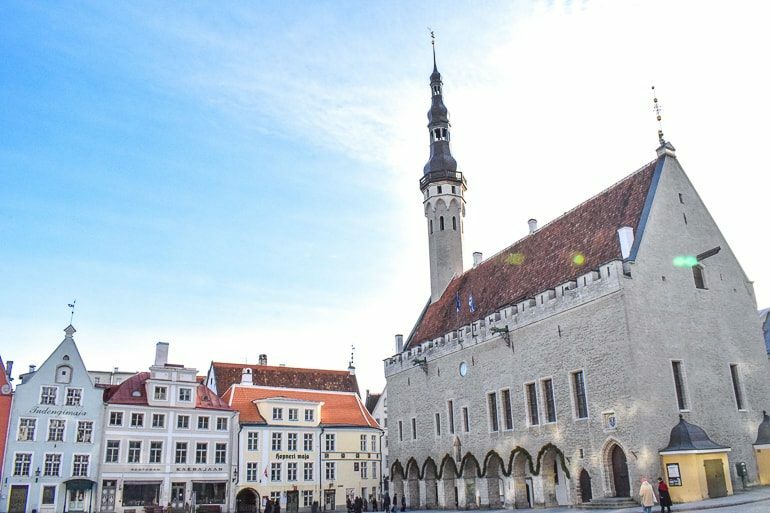 The heart of the Old Town in Tallinn – far from the bus station but WOW it’s pretty! Arriving into Tallinn was simple enough. The bus pulled into a large bus station complex with loads of other buses. We got off and grabbed our bags (using the LUX numbered ticket stub). To be honest, the bus station is far from the Old Town/centre of the city. At least, it’s not nearly as close as in Vilnius or Riga. You can take the number 17 or 23 bus or you can take the number 2 or 4 tram to get to the city centre. Opting for speed and simplicity, Craig and Eric hopped in a taxi (they are waiting nearby) and took that to get into the centre where they were staying. The driver was nice – just be sure to ask about the rate beforehand so you don’t get ripped off. Not that you would, but it happens everywhere. Again, for the record, we (Eric and Craig) stayed just outside of the Old Town in Tallinn at Red Emperor Hostel. We had a nice stay there for a few nights and would recommend if you need a hostel! 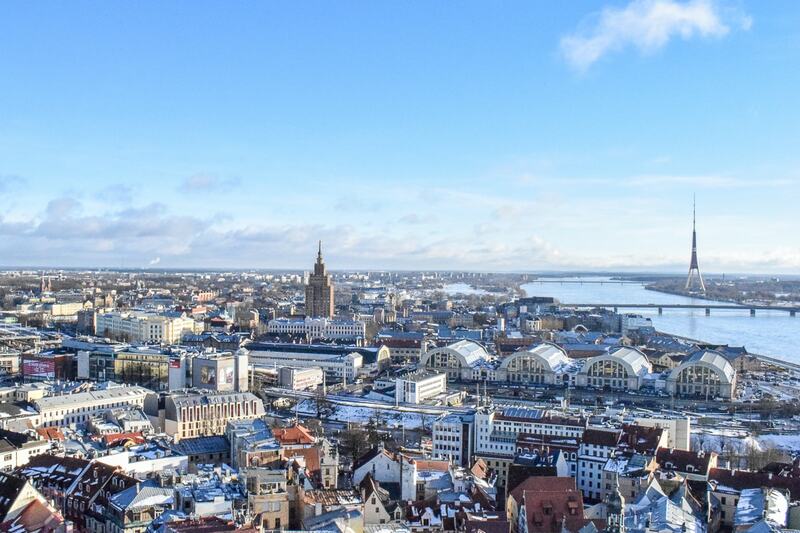 And there you have it – a detailed guide on the bus journey from Vilnius to Riga to Tallinn. Honestly, travelling with LUX Express was easily one of the best European bus experiences. That’s saying something with the amount of buses we’ve taken. The Baltic coach buses are a great way to get around, see the countryside, and save money. We can’t wait to get back to the Baltic (a first time for Lisa) to see the capitals and explore more of these tiny but awesome countries! Taking the Baltic buses? Let us know how your experience goes!